Affinty. 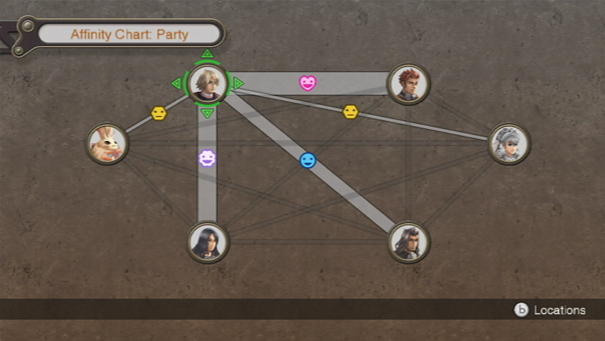 In Xenoblade Chronicles, the relationships between characters are very important. Affinity levels affect effectiveness in battle, gem crafting, skills, and unlocking the heart-to-heart moments.You can build better relationships between characters by placing them in battle together. You can also raise affinity by completing quests with the characters you want to raise affinity with in your main party. Heart-to-heart moments also raise affinity. The image shows the affinity chart for your party where you can check the current affinity level of your party members.